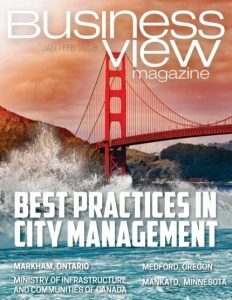 Business View Magazine interviews representatives of the Gila River Arena, as part of our focus on best practices of North American venues. The Gila River Arena is a sports and entertainment arena in Glendale, Arizona, about 12.5 miles northwest of downtown Phoenix. It is located in the 223-acre, $1 billion Westgate Entertainment District, a regional destination for shopping, dining, sports, and entertainment. The Arena is home to the Arizona Coyotes of the National Hockey League, as well as other sporting events, such as high school basketball, volleyball, wrestling, and cheerleading. The Arena also hosts world-class musical concerts. Bette Midler, Prince, Rod Stewart, Toby Keith, Britney Spears, Usher, U2, Elton John, The Rolling Stones, Paul McCartney, Bruce Springsteen, Kenny Chesney, Motley Crue, Justin Timberlake, Katy Perry, Taylor Swift, Justin Bieber, Marc Anthony, Aerosmith, Lenny Kravitz, Nickelback, Bon Jovi, Madonna, Red Hot Chili Peppers, Christina Aguilera, John Mayer, Tim McGraw, Faith Hill, and the Eagles have all performed there. Its roster of family shows includes the Radio City Christmas Spectacular, Nickelodeon Story Time Live!, Sesame Street Live!, the Harlem Globetrotters, and Cirque du Soleil. The Gila River Arena opened in 2003, a public/private partnership between the City of Glendale and the owner of the Phoenix Coyotes, real estate magnate, Steve Ellman. Completed at a cost of $220 million, the Arena replaced the older and smaller America West Arena (now the Talking Stick Resort Arena), where the Coyotes had played since 1996, after the franchise moved to Arizona from Winnipeg, Canada. While the AWA was designed primarily for basketball, and is the home of the Phoenix Suns of the NBA, it was not a good venue for hockey. In fact, it was just barely large enough to accommodate a regulation hockey rink, and several seats had badly obstructed views. By contrast, with two separate concourses on two seating levels, Gila River Arena is fan-friendly and provides an open view of the ice. Seating capacity for ice hockey is 17,125 (18,000 for basketball, and up to 19,000 for concert events). There are 87 luxury suites in the Arena, including two tower suites and 12 party suites that can accommodate large groups of up to 50 people. In addition, the Suite Level Club consists of 400 upscale seats with unique club and dining opportunities. While the Fireball Terrace, a bar and eatery, is open to all guests in attendance, the BMW Lounge is an upscale, private club, open exclusively to season ticket holders. 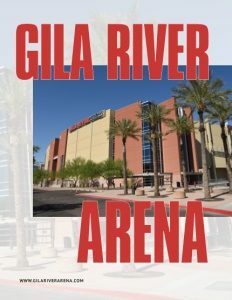 Naming rights to the Arena were initially held by Jobing.com, a Phoenix-based employment website, but in 2014, they were transferred to the Gila River Casinos, owned by the Gila River Indian Community. The nine-year sponsorship marked the first time that a Native American tribe held the naming rights for a venue in which one of the four major North American professional sports leagues, competed. In that same year, the hockey team officially changed its name from the Phoenix Coyotes to the Arizona Coyotes. In 2016, the City of Glendale selected facilities-management company, AEG (Anschutz Entertainment Group), to operate the Arena, cancelling its contract with IceArizona, its former operator. AEG, a Los Angeles-based company, and its affiliated companies own, operate, or consult with, more than 120 venues worldwide, including the Staples Center, which is the home arena for the Kings of the NHL, the Los Angeles Lakers, and the Los Angeles Clippers. AEG also developed L.A. Live, a bustling sports and entertainment district adjacent to the Staples Center. The company’s entertainment division, AEG Live, ranks as the world’s second-largest concert-promotion company. Sean Langer, Director of Operations, believes that the relationship with the parent company is a competitive advantage for the Arena, as is the building’s location in the Westgate Entertainment District next to many other venues and attractions, including the nearby University of Phoenix Stadium, home of the Arizona Cardinals of the NFL. In addition, he says that his staff of 40 is “first-rate” and the building, itself, “is beautiful.” “We’re continually trying to make improvements, though, and part of our job is making sure we’re keeping up with technology and doing all the necessary upgrades to make it more attractive for concerts and other types of tenants,” he affirms.